Beautiful sunny day predicted by the weather app, rain tomorrow. With only 2 days before we pack up the caravan and head towards our next destination we decide that today is the day to visit the ‘tulips of (just south of) Amsterdam’. It seems that the world, his wife and his dog looked at the forecast and thought the same thing. We should have realised that it was going to be busy as we sat for an hour in traffic on our way there. Once at the gardens, we were guided into a field of different coloured, shiny… cars. The biggest car park we’ve ever had the pleasure of parking in. Look for a landmark so that we can locate our car on our return. Motorhomes are welcome and rows of them stood to attention looking like the forecourt of a prestigious dealer. 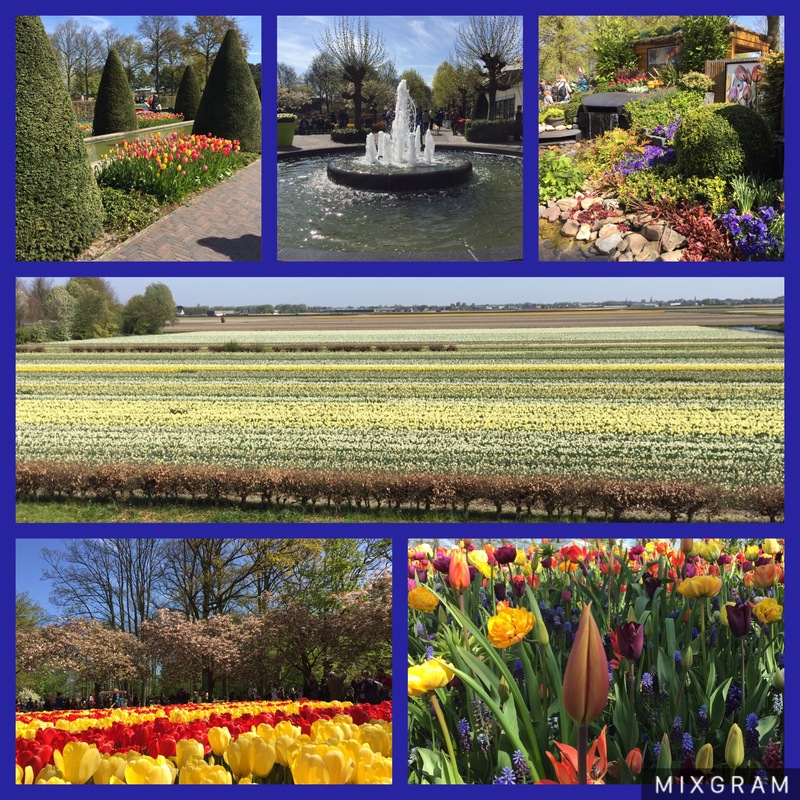 Keukenhof is described in the expensive and not really needed guide book as ‘The most beautiful spring garden in the world.’ Boasting millions of flowering bulbs, it really is spectacular. The park opened its gates in 1950 and to this day is a popular attraction. The garden has multiple indoor halls displaying plants and flowers in addition to the acres of outdoor beds. To add to the blasts of colour as far as the eyes can see, sculptures, fountains and babbling brooks are dotted around. In a small part of the gardens there is also a small petting area where you are encouraged to walk with the turkeys and watch the pot bellied pigs snuffling around in the mud. Boat trips glide past fields of flowering bulbs. 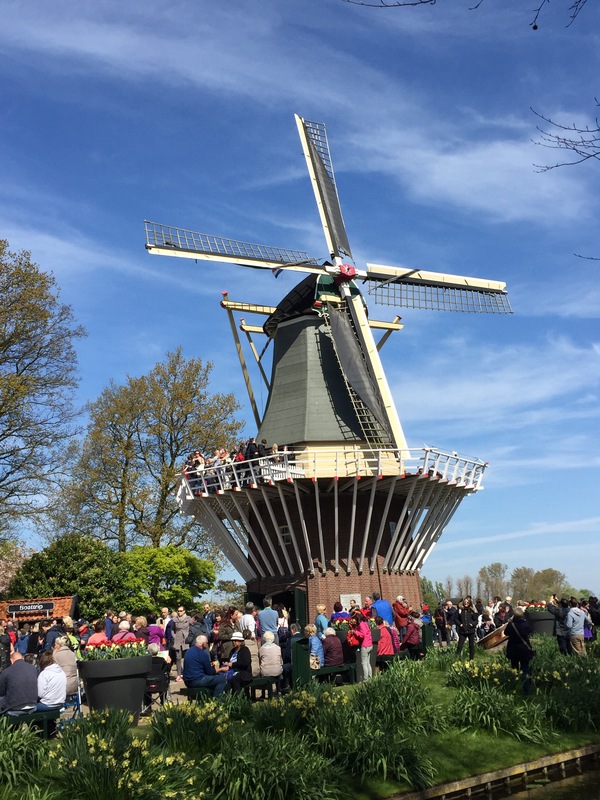 A windmill stands proud in the gardens, people queue to enter and climb to it’s viewing platform. The gardens are wheelchair and pram friendly and dogs are welcomed with the grounds. There are food stalls selling everything you could possibly want from strawberries and burgers to the humble bottle of water. Toilets are located at the entrance before you pay. Smaller queues for the ladies where found inside the halls in the gardens themselves. 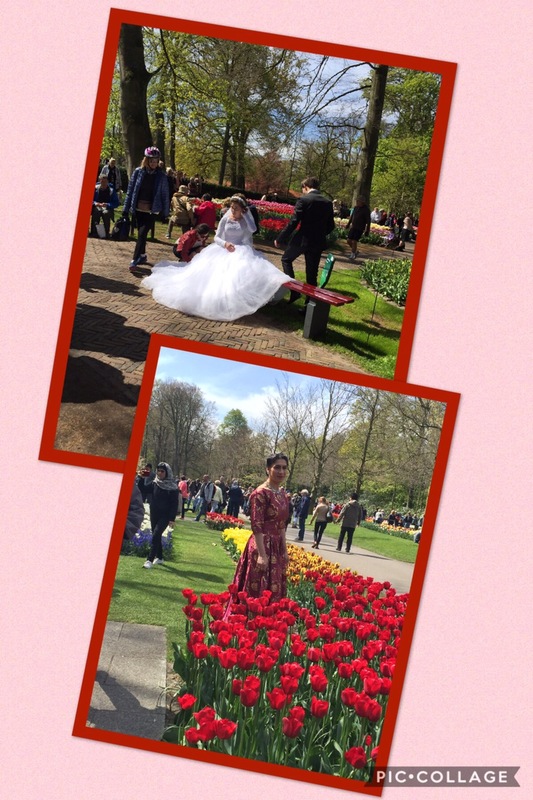 Beautiful brides posed amongst the floral delights, whilst family members stood and oohed and ahhed. I wonder if they all paid to get in? Expensive photo shoot if they did. This is where I digress, whilst the gardens are stunningly beautiful they are spoiled by people. Flower to flower people. Bumped and shoved as people with cameras bigger than any used by the BBC try to aim and shoot to get the perfect shot of stamen within purple petals. Imagine, a Rolling Stones stadium concert at kicking out time. Shoulder to shoulder, bustling for the exit. This goes on and on throughout the gardens. Shuffling, pausing en mass to admire a bed of tulips in all the splendour. Peaking between heads of the people in front of you to see why we’ve stopped this time. Stopping suddenly as someone way ahead pauses without warning to take a selfie. Too many people in my personal space for me to fully appreciate nature’s splendid beauty. With a €6 parking charge, €16 per person to get in and €5 for the guide book, this has started to get expensive because after only two hours we can’t cope and are heading for the exit. The place is stunning and with only two months of visual delights is always going to be busy, our advice, try to go on a weekday out of any holiday period. Even then it will attract the masses, there just maybe, if you’re lucky, a few less. 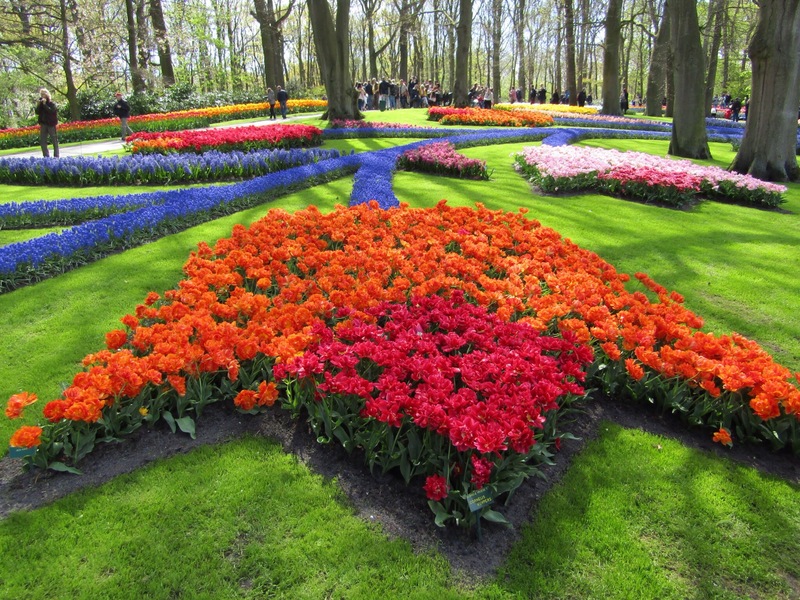 Keukenhof is only open to the public for eight weeks of the year. This year it’s final day is 3rd May, 2017. Next year the opening dates are 22nd March to 21st May, 2018. For us, this goes on the same list as New York, love that we got to see it, but would not bother a second time. Take that as a weird recommendation. Beautiful pictures, but I understand your frustration with so many people. Not long ago I was at a wings and wheels show, got there early for a spot right up at the fence to the runway/road, but over the morning more and more people jammed their way in with these massive cameras totally spoiling our view! We went last year and it was busy but not as bad as your day by the sounds of it. We went on a Monday. We headed straight for the furthest part and worked our way back. €6 for parking was a bit steep I agree. It was on our ‘must see’ list. On a long trip like this we will need to be selective on fee paying attractions.